I am a huge fan of fine art and nature multi-media and have experimented with it a bit here. Nature speaks to us on multiple channels. When you’re out in the world you don’t just see. Experience encompasses what we hear and feel as well. All that being said, I think good multi-media is hard to pull off. It is easy to go too long, too short, too everything, and lose the viewer. I have mentioned Ron Rosenstock’s work here before as well. He is one of our finest and most productive fine art photographers. I’m very grateful for his support the last few years. Ron’s work, particularly his books, often try to capture the more complex feel of his appreciation of nature through the use of accompanying poetry. He recently alerted me to a new multi-media work, inspired by his book, The Light Within, in which his imagery is accompanied by a new musical composition from Eugene Skeef, a noted South African composer. In addition, the piece contains haiku by Gabriel Rosenstock (no relation I gather) with whom Ron has collaborated in the past. Too often, multi-media pieces though struggle and seem to take forever. For me, this one just flies by. Enjoy. Contemplating the passing of another fall, I’m always reminded that fall is why I got into photography in the first place. When you stop to think about it, why should nature put on such a light show for us? Seriously??? But she does thank goodness and so we appreciate. Nature meets humanity. It is one of the great conundrums of our lives and impacts everything we worry about and enjoy at the same time, from a wonderful day at the beach to global warming. It’s all about what we experience, or rather notice, and how we interpret what we notice. 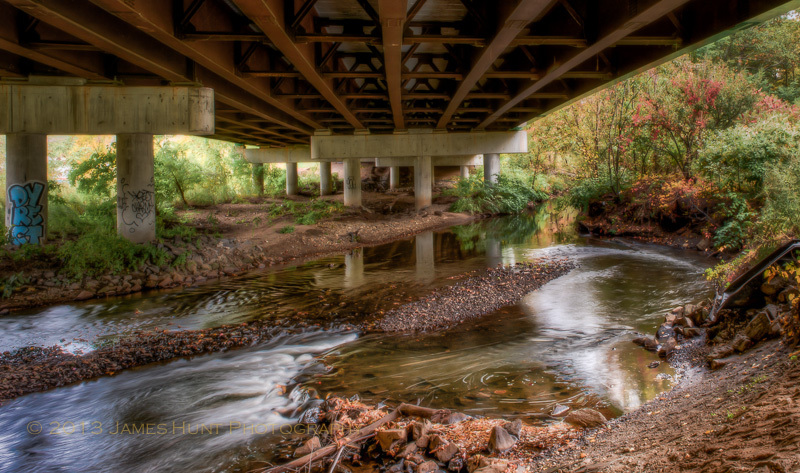 So I’ve been looking for points of intersection that seem particularly interesting and I found one, under the highway. In this case, I’m referring to Route 146, AKA the “little dig” which was transformed a few years ago into the Blackstone River Valley National Heritage Corridor that runs from Worcester, Massachusetts to Rhode Island. The Blackstone River has followed that basic route since the last ice age, but it was also the location of the Blackstone River Canal which was designed to run from Worcester to Providence before their war railroads, in the early 1800’s. Alas, the railroads were not far behind and the Canal never saw much service. Route 146 was the connector between the two cities and when it was being redesigned at the Worcester end, the State wisely, thankfully, decided to include a path/bikeway and connect the people once again to the river. As you can see, however, the connection is, to a degree, quite funky. 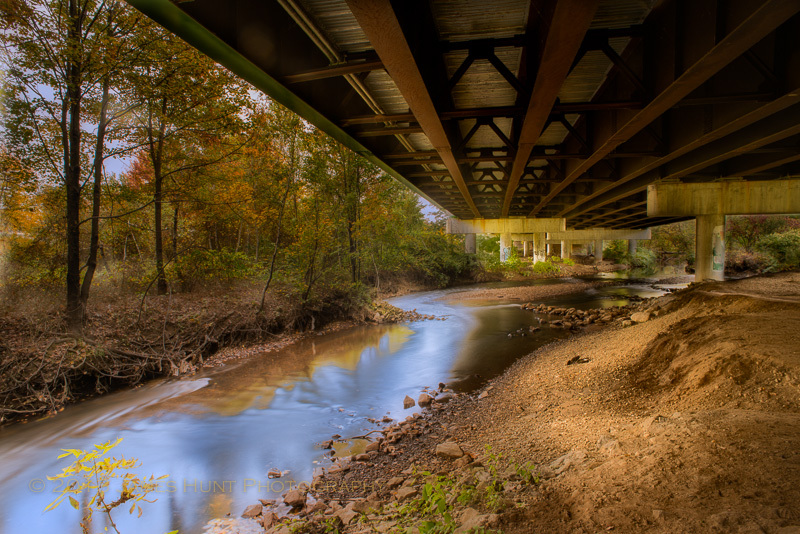 The river and path share the road with, well the road, the road supports and graffiti artists. Late at night, we could probably add some other elements to the menu, but you get the idea. Urban meets nature. Nevertheless, it creates a compelling, though tough to photograph view. We were of course lucky to be there just at the peak of the foliage. The contrast between nature and the artifacts of the urban was intense, but somehow enjoyable. The river, depleted a bit because of the lack of rain and because of well, the fact that it has a tough life at this point in its career, keeps on flowing nevertheless. Tech Note: Photographers will recognize that these shots are “HDR” or high dynamic range shots, pulled together in Photomatix. 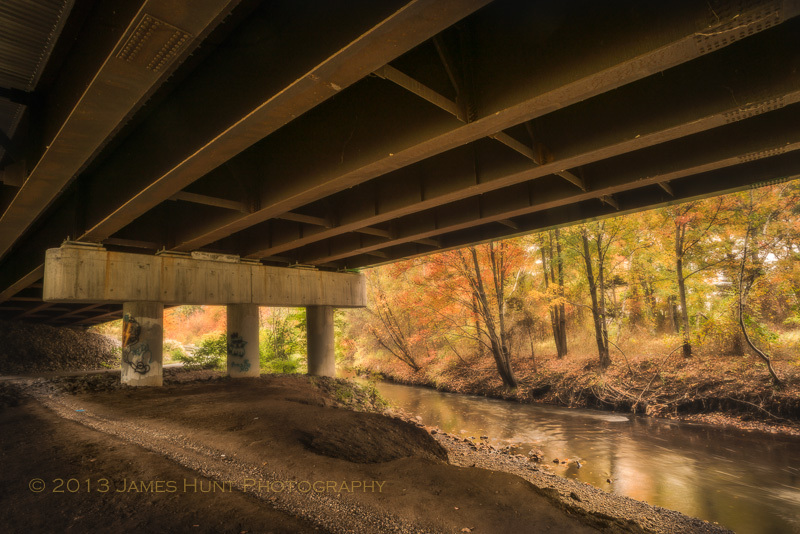 Under the highway the difference between dark and light is too great for the sensor to comprehend. Multiple shots, taken on a tripod, hopefully with no wind and no touching, allow you to capture the highlights and the shadows. However, the results sometimes don’t look that natural (though I tried to stay true to what I saw), which is the case here. This to me represents another piece of evidence that nature (our eye balls in this case) can still trump technology, at least for now.